Drostanolone Propionate and Enanthate is an injectable steroid which contains the hormone Drostanolone Enanthate 150mg, Drostanolone Propionate 50mg. Drostanolone Propionate and Enanthate is most commonly used by bodybuilders who are in the "cutting" phase of their training and dieting. While only mildly anabolic, this steroid extremely androgenic and because of this, brings about a very pronounced amount of hardness and definition to the muscles. 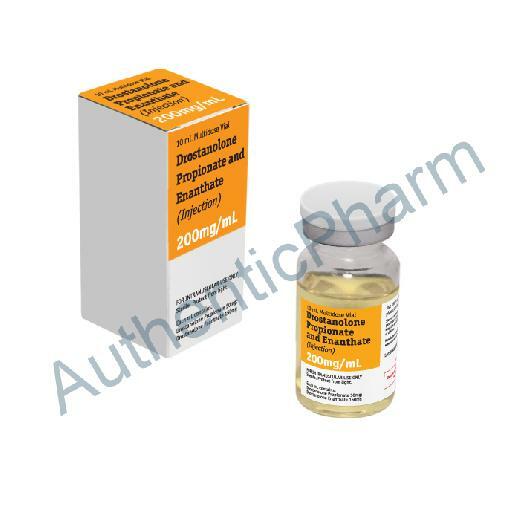 On top of this, Drostanolone Propionate and Enanthate is also noted as being an effective estrogen blocker, and also binds to SHBG, making it possible for other steroids being used to bind more easily to their respective receptors, thus making their presence in the body much more effective. These effects are also noted by bodybuilders who choose to use the oral preparation of Drostanolone Propionate and Enanthate, Proviron. Bodybuilders looking to incorporate Drostanolone Propionate and Enanthate into a cycle might stack it with other steroids such as Trenbolones, Testosterone Propionate, and oral compounds such as Stanozolole or Halotestin to bring about an even more pronounced amount of definition and hardness leading up to a contest. Common androgenic side effects are possible with Drostanolone Propionate and Enanthate, such as oily skin and increased libido. Due to its extremely androgenic properties, this drug is not a favorite among women bodybuilders, although most serious competitors still choose to use it due to its effectiveness as a pre-contest drug. Males typically use a dosage of this steroid ranging from 300-600mgs per week while women typically prefer a dosage range of 100-300mgs per week. This drug is often injected once every 2-3 days to help maintain consistent blood levels.